제조회사 : Miracle Greens, Inc.
* 개봉후에는 냉장보관 하시기 바랍니다. * 내용물은 통의 3/5 정도 담겨 있는것이 정상 입니다. 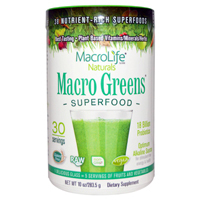 WHY Macro GREENS? 왜 마크로 그린 인가 ? 종전의 미라클그린 ( Mircle Greens) 는 제품이름을 마크로그린 ( Macro Greens) 으로 이름을 바꾸었으나 구성성분 은 종전과 동일한 제품입니다. 조화롭게 배합 제조 되었으며 일명 "Super Food" 으로 불리기도 합니다. Miracle Greens contains thirty-eight synergistic ingredients that feed the body at cell level, nourishing with anti-oxidents, co-nutrients, enzymes, vitamins, minerals, and amino acids. Made with no common allergens and certified organic barley grass and other natural ingredients, Miracle Greens includes antioxidants, adaptogenic and metabolic herbs, natural fibers, harmonizing and support herbs and natural plant enzymes. WHAT ARE THE BENEFITS OF USING MIRACLE GREENS? 이루어 활력과 체중감소 및 건강 에 더욱 좋은결과 를 얻으실 수 있습니다. Energy, Weight Loss, Mental Sharpness, and Blood Sugar Balance Double apple juice and water and divide into (2-3) servings and drink throughout the day. For best results: Drink a glass before breakfast, lunch and dinner. As you drink Miracle Greens throughout the day you will enjoy sustained energy, mental sharpness, blood sugar balance, and diminished food cravings. This will help you make better food choices that are necessary for weight loss. 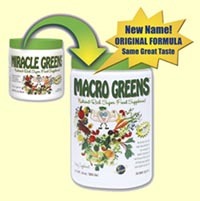 Miracle Greens also encourages a healthy pH balance, which greatly enhances weight loss and health. Once you are accustomed to drinking Miracle Greens you can increase Miracle Greens tablespoons to 2-3 per day and decrease apple juice to 1/3 juice and 2/3’s water and then ¼ juice and ¾ water. Keep cold or refrigerated. Best used within 48 hours. Fruit Smoothie 사과주스, 냉동딸기, 바나나 등을 첨가해 드시면 더욱 좋습니다. Apple juice, frozen strawberries, bananas, 1 scoop Miracle Greens, blend till smooth.